I've had my battery tested and it only puts out 7 volts, has anyone ever investigating getting it reconditioned? There must be many a classic car whose owners have had the original battery brought back to life, so surely someone must do it. I've spent a while googling it but can't find any one offering such a service. Any ideas anyone? Hi Gary, going off at a tangent for a moment, there is something radically wrong here. The control box (CB) is setup to cut the motor when the voltage drops to less than 10.5 volts. This is to protect the battery. In another post you reported that the motors was cutting out, if your battery has only 7 volts the motor should not work at all. . It looks like the op-amp (an integrated circuit in the CB), or part of the op-amp external circuitry, is not operating correctly. If the battery is down to 7 volts when fully charged you can consider it the be dead. If you had a lack of capacity something could be done, but this is not the case. Are your LEDs in the pod working correctly? If you are not sure how they work have a look in the 'RESOURCES/Original Documents' section of the forum, there you will find a copy of the 'Owners Handbook'. There you will find a description of the pod operation. Hi Gary, with reference to your Amazon order. I mentioned in my previous post "If you had a lack of capacity something could be done, but this is not the case.". This is the unit for this purpose. Give it a try, you may be able to kick a little bit of life out of the old battery. If you are lucky you might just hit the 12v mark, again with a lot of luck you will be able to achieve 50 yards or so. I would keep the unit for your new battery, but it'll be sometime before you'll need it. Here's what I would do if I'd like to have original look. Take LiPO or better LiFe pack and put it inside the original battery cover and there you have it. If you're more of a purist then take the old battery and first carefully unseal it, with even more care pour get rid of the electrolyte and then everything else that's inside. Neutralize acid residue with some alkaline compound. Wash everything. Put LiPO or better LiFe battery pack into original pack casing. There are parts that just need to be replaced in old cars too for example rubber elements, brake pads and BATTERIES and there's nothing you can do about it. It's just physics and chemistry. I like the sound of that, Where does one get alkaline compound? Hi Gary, you can use any type of strong alkaline household bleach, e.g. Domestos, Danklorix, etc. You are all so helpful and willing it seems to entertain my noob questions, thank you One more: where do I dispose of battery acid? If it were a battery i'd take if to the tip, but "loose" ? @chas that's exactly what I need to do. Did the "lid" come of easy or is there a trick to it ? 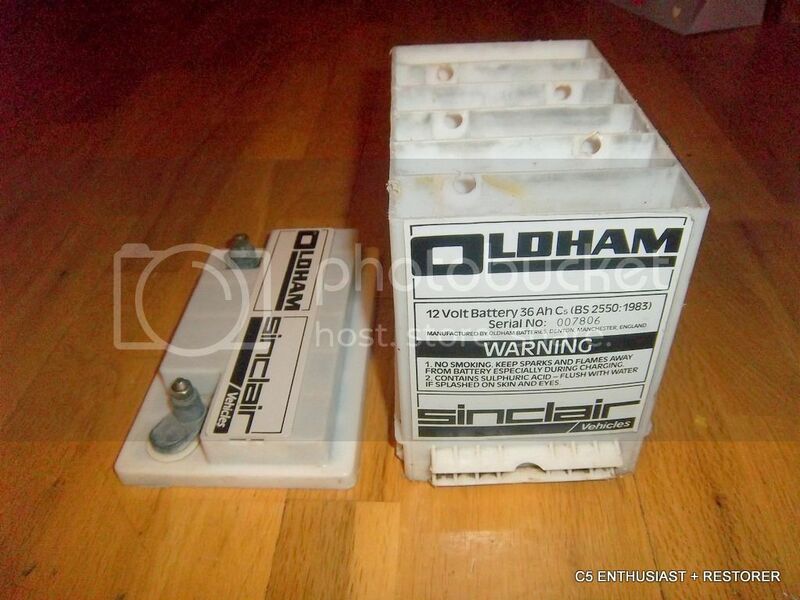 I wish I could lay my hands on a couple of the Oldham batteries, but they are rarer as hen's teeth here in Germany. I don't know when production ceased, but it must have been a long time ago. Like an idiot I turned one down when I bought the new C5 as it had been leaking, and I needed to keep the transport cost down. This subject cropped up some time ago, but just after the battery had been scrapped. So Gary if you don't need yours please fold it up, put it in an envelope, and send it to me.